New Avengers #7: This series has been all about putting the best and brightest minds in the Marvel Universe down an incredibly slippery slope of good intentions. So far, the slide has been breakneck with a universe-threatening event—and just a little bit more moral erosion—happening just about every issue. Things quiet down a little bit here but the lack of fisticuffs makes the character tensions even more enjoyable. How good do good guys have to be to save the world? That’s debatable. But, they certainly don’t have to tell the world’s biggest tyrant what they’re up to. I’ve written before about how the Black Panther is one of my favorite superhero characters and this series has been shown off one of the reasons why. T’Challa and his unique place in the Marvel Universe serve as a window into a sort-of superpowered statecraft, which was a highlight of the Black Panther series written by Christopher Priest. In the same vein, the diplomacy that happens in New Avengers #7 juggles several world-ending situations, with the fate of each hinging on the personalities of the people having them. It’s here that writer Jonathan Hickman gets to execute some nice tweaks on how these characters are usually portrayed, ably abetted by strong Mike Deodato artwork: The impulsive Sub-Mariner extending an olive branch for peace, Dr. Doom—usually uber-confident and arrogant—inviting enemies into his home to try and extract knowledge from them or Reed Richards being cagey and even a little bit sinister in response to that. New Avengers continues to be a series where the trajectory is entertainingly difficult to predict. Yes, you know that Iron Man, Dr. Strange and the others are all heading to some sort of existential hell. But what will the stops be? Who’ll get there first? 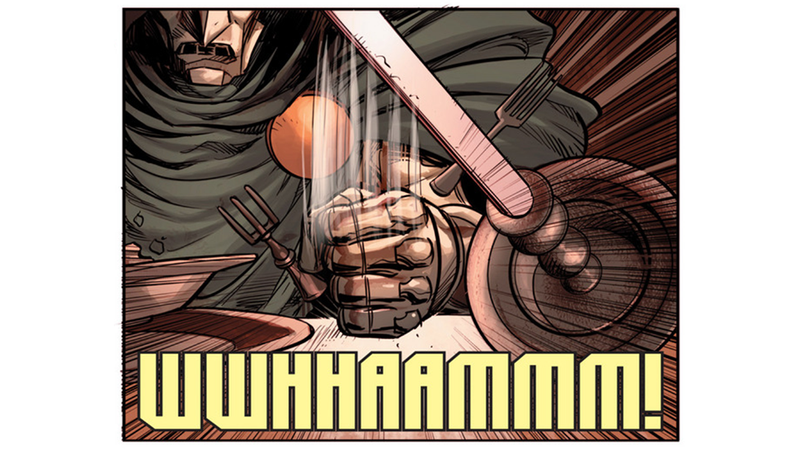 Fantastic Four #9: Remember that Von Doom arrogance I mentioned above? This issue of the main Fantastic Four book has it in spades. I know that Marvel holds writers’ summits to plan out their big events and whatnot but I have to wonder if the preponderance of Doom in this week’s comics is a happy coincidence or something intentional.